The Starwood American Express cards are among the most flexible hotel credit cards available and the points are valuable for both hotel stays and flights. The sign-up bonus on both the personal and business version of this card just increased to 30,000 points after making $5,000 in purchases within the first 6 months of card membership. Starwood points are among the most versatile hotel points out there and hands down have the most valuable and numerous airline transfer partners of any card. Many hotel credit cards have a low value transfer rate to airline miles, but you will get a 1:1 transfer when you transfer Starpoints to most airline partners. 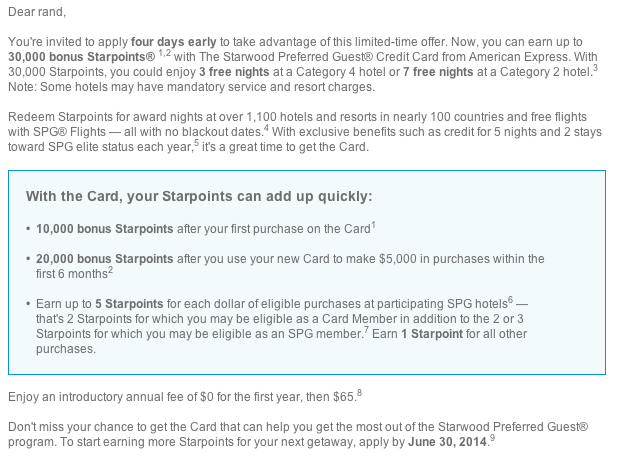 The normal offer on these cards is 25,000 Starpoints after spending $5,000 within 6 months, but historically every Summer the card has a limited time increased offer of 30,000 bonus points. The best part is existing card holders can refer people and earn 5,000 Starpoints for each person referred that signs-up for the card. I don’t currently have this card, so if you have a referral link or email someone can reach you at feel free to share it in the comments below. 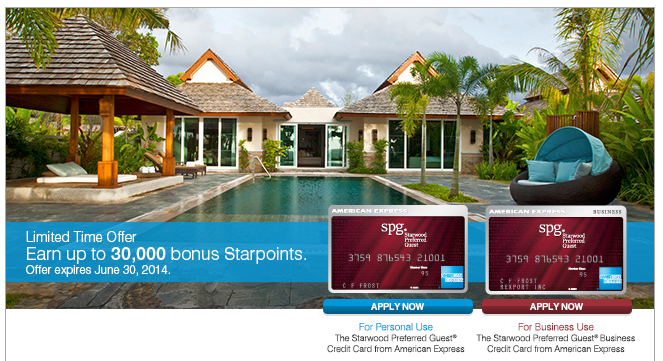 This is a great way for existing card members to earn a few extra Starpoints and for anyone who has not earned the bonus on these cards to earn a valuable bonus of 30,000 Starpoints. Remember that American Express now only awards one sign-up bonus per lifetime on personal credit cards, so if you have had this card before you may not qualify for the bonus. I’d love o offer personal SPG referral to anyone who is interested. Feel free to email me at shayatouxiaojia@gmail.com so I can get back to you. Thanks! I have the Personal and Business SPG Card. I’ll refer anyone who needs it. Please email me at a1anchang@yahoo.com and let me know which card you’d like to use. choi, I don’t have a referral link for the SPG cards, but thanks for the support!